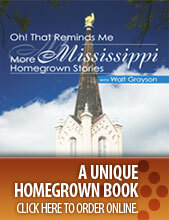 Mississippians love sweet potatoes as a tasty, nutritious and inexpensive addition to any meal. Sweet potatoes are a big deal for Mississippi farmers too. Mississippi ranks second in the nation in sweet potato acreage and third in production. “This year the Mississippi acreage was down somewhat and is about 25,000 acres as opposed to 2017, when we grew over 28,000 acres,” said Sylvia Clark, of the Mississippi Sweet Potato Council. Mississippi’s sweet potato industry contributes more than $130 million in total value each year to the state’s economy and creates more than 1,000 jobs, according to the Mississippi State University Extension Service. Calhoun, Chickasaw and Webster counties are the state’s primary sweet potato-producing counties. This is the home of the famous Vardaman sweet potato, named after the sweet potato-growing town in Calhoun County. What makes the Vardaman sweet potato special? “We think it’s the soil and the climate and the expertise of the farmers, because they’ve been doing it so long. They just know what to do,” Clark said. “There’s just something about the flavor of the Vardaman sweet potato that we think is exceptional,” she said. Vardaman’s sweet potato production dates to 1915 when a few families from Martin, Tenn., established small farms in the area. Fourth- and fifth-generation growers from those original families continue the tradition. “They’re all still family farms, even the largest one that grows 3,000 acres,” Clark said. Natchez Trace Electric Power Association serves the farms’ electric power needs. Sweet potatoes and potatoes are both root vegetables, but they come from different plant families. 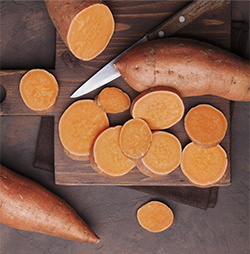 The sweet potato is an excellent source of beta-carotene, vitamins A and C, dietary fiber and many other nutrients. The Center for Science in the Public Interest ranks sweet potatoes above all other vegetables for nutritional content. And they’re suitable for people who are trying to reduce their consumption of carbohydrates. Sweet potatoes can be baked, boiled, steamed, roasted, grilled, microwaved and even eaten raw. They are enjoyed year-round in casseroles, dips, salads, or simply served alone as a side dish. The Mississippi Sweet Potato Council offers recipes—included those reprinted here—and nutritional information at MSSweetPotato.org.